In the "And You Thought You Had Union Problems" Department, North Korean Labor Union Threatens To 'Blow Up Den' Of South Korean President Park Geun-Hye's Regime If Provoked | Godwin, Morris, Laurenzi & Bloomfield, P.C. 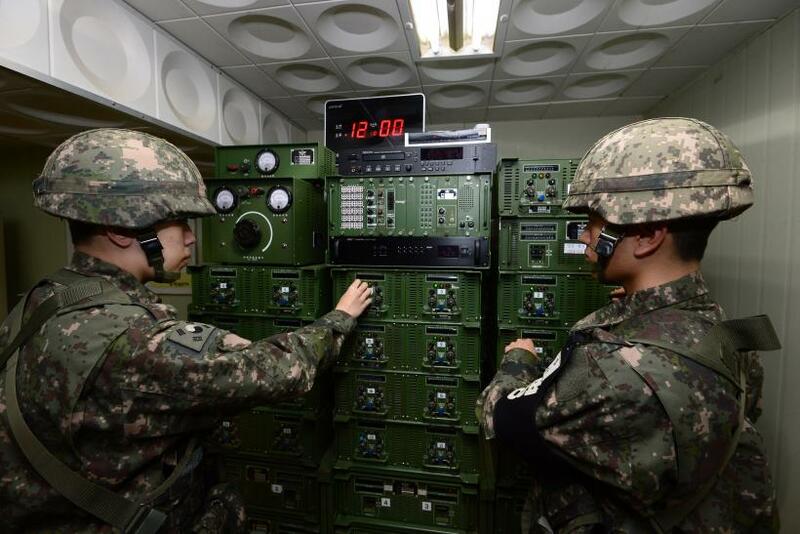 South Korean soldiers operate the loudspeakers at a studio near the border between South Korea and North Korea on Jan. 8, 2016 in Yeoncheon, South Korea. The North Korean labor union slammed South Korea and the U.S. for conducting military drills, and allegedly threatening the reclusive state's leadership, Yonhap News Agency reported Sunday, citing a statement by the General Federation of Trade Unions of Korea's (GFTUK) central committee. "On behalf of all the workers, the U.S. imperialists and the [South Korean President] Park Geun Hye group of traitors of South Korea for their heinous moves to get the sun eclipsed, not content with running amuck in the reckless moves to invade the DPRK [Democratic People's Republic ]," GFTUK said in the statement, according to Yonhap. The federation further warned that if provoked, the North's working class will join the army to "blow up the den of the Park's regime, liberate the southern part of Korea and build a new society for the working people there, tightly holding arms of the revolution instead of hammer." The statement also said that North Korea will ultimately win the final confrontation with the U.S. and reunify Korea as Park and her followers will pay the price for their actions, Yonhap reported. The statement comes a day after North Korea's propaganda website released a video showing an imagined submarine-launched ballistic missile hitting Washington, D.C. and exploding the Capitol building. In the video, Pyongyang also warned the U.S. of nuclear attack by the North. Earlier this week, another propaganda website of the North reportedly released a footage, showing Pyonyang blowing up South Korean president and the presidential office. North Korea is facing sanctions from the U.S., South Korea and the United Nations Security Council over missile tests and its nuclear advancements it carried out since the beginning of 2016. Washington and Seoul are also in talks to deploy the Terminal High Altitude Area Defense anti-ballistic missile system installation to tackle the increasing threat from North Korea.